In Nunavik, there are many dogs — sled dogs, pets, and strays — but no veterinarian, so the University of Montreal International Veterinary Group has given Andréanne Cléroux, a veterinary student, the mandate to design and deliver a first aid guide for dogs in northern Quebec. “The problem relates mainly to animal health care, immunization, and dog population control,” Cléroux explains. “We wanted to create a guide that would provide basic tools for pet owners so they can provide care to their animal while waiting to contact the remote veterinary consultation service to get advice from a veterinarian at the CHUV (University of Montreal Veterinary Hospital). The initiative is part of the Support project in veterinary public health and animal health in Nunavik, which began in 2008 with the creation of the remote veterinary consultation service. Last year, Cléroux spent a month writing the guide before flying to Nunavik. During her one-week stay, she presented a draft of her work to several inhabitants of the town of Kuujjuaq. She was accompanied by the junior college student Emaly Bibeau Jonas, who provided interpretation between Inuktitut and French. “Through their comments, I was able to rework the guide to make it more simple, concise, and user-friendly,” says Cléroux, who was supervised by the Faculty of Veterinary Medicine’s Dr. Denise Bélanger, Dr. Cécile Aenishaenslin, and Dr. Josiane Houle. The challenge, she notes, was to produce a manual that would address both those unfamiliar with animal health care and those who already have more advanced knowledge, such as dog sled drivers. “Dog mushers are great for recognizing and treating all kinds of medical conditions,” says Cléroux. With accompanying photographs, the guide covers everything from vaccination schedules, drug administration, and care of newborns, to sterilization, zoonotic diseases, fractures, and bandaging methods. 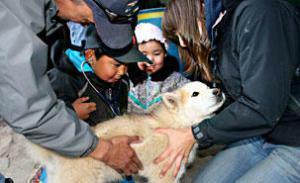 Vaccination campaign Rabies is an often-cited problem in Nunavik. “It’s an endemic problem. There are reported cases every year,” notes Cléroux. The ministère de l’Agriculture, des Pêcheries et de l’Alimentation du Québec (MAPAQ) visits the communities in Hudson Bay and Ungava Bay to conduct annual vaccination campaigns. They provide basic and antirabies vaccines. Local vaccinators are also present at other times of the year. “There is still room for improvement, but we must recognize that vaccination is more widespread than before,” says Cléroux.